Dorotheenstadtischer Friedhof is a cemetery in Berlin dating back to 1762. It serves as a resting place for many well known Germans. Today many visitors come to this cemetery to stroll through the graves and see the headstones of the intellectual and artistic leaders who are buried here. There is also a monument honoring resistance fighters killed by the Nazi regime and a mass grave containing 64 people killed near the end of the war, most of whom are unknown. The names include the philosophers Hegel and Fichte, the authors Heinrich Mann, Johannes R. Becher, Arnold Zweig and Anna Seghers, the director Heiner Müller, the architects Friedrich August Stüler and Karl Friedrich Schinkel, the artist John Heartfield, the actress Helene Weigel, and the printer Ernst Theodor Litfaß. There is also an honorary grave for the former Federal President Johannes Rau. The house where the playwright Brecht spent the last years of his life with his wife Weigel is located at the entrance to the cemetery. Today the Brecht Archive and the Literature Forum are located here. Dorotheenstadtischer Friedhof is located at Chausseestrasse 126. Take the S1, S2, or S25 to Nordbahnhof, then go west on Invalidenstrasse and south on Chausseestrasse. The cemetery is open daily. Hours are January and December 8am to 4pm, February and November 8am to 5pm, March and October 8am to 6pm, April and September 8am to 7pm, and May through August 8am to 8pm. Erleben Sie Deutsche Kulturgeschichte an einem ihrer herausragenden Orte. Hier wandeln Sie durch Alleen, die von den Gräbern der Großen unserer Geschichte gesäumt sind. Erfahren Sie mehr über deren faszinierende Biographien und ihr Verhältnis zur Gesellschaft. 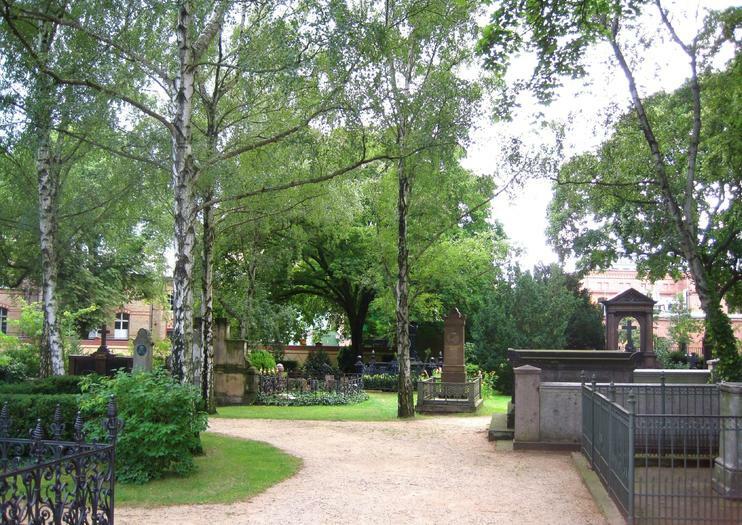 Explore the Dorotheenstadt Cemetery in Berlin on this 2-hour walking tour. Visit the 18th-century Dorotheenstadt Cemetery with a guide, and gain insight into the famous figures that lie buried there. Discover the graves of theater director Bertolt Brecht, actress Helene Weigel, novelist Heinrich Mann and anti-fascist activist Arnold Zweig. Hear the life-stories of artists and politicians living and working in a divided Berlin, and gain insight into life before unification. See where famous fighter pilot Manfred von Richthofen lies interred, and learn of the no-man's-land behind the Berlin Wall.